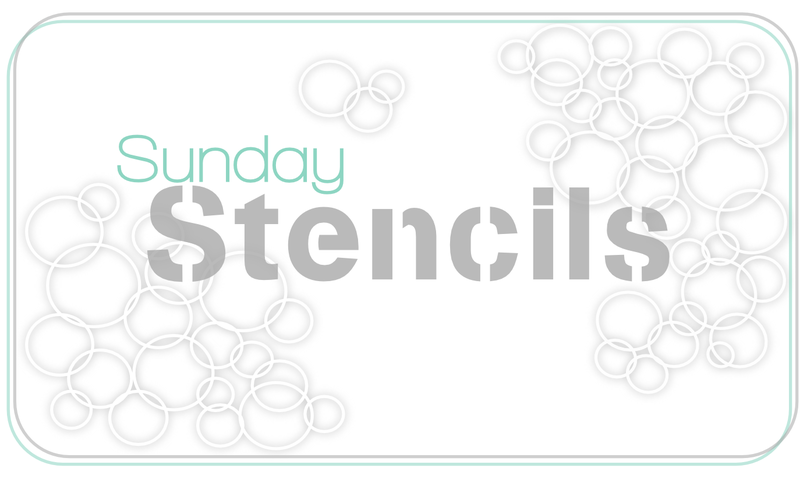 Stencil Sunday #1 + Happy Birthday Kelly! 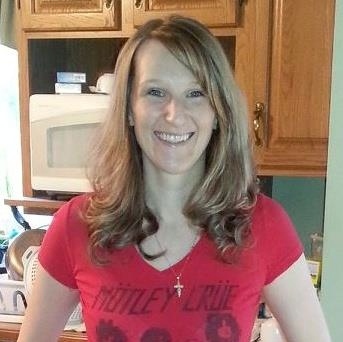 Before we start the "actual post" I'd love to give a BIIIG shout out to our Birthdaygirl Kelly! Kelly, I hope you have a BLAST and enjoy your day! I am so happy to have you on this team! :) Happy happy birthday! Today's video is about a comparison of acetate and mylar - two materials that I use to create stencils. 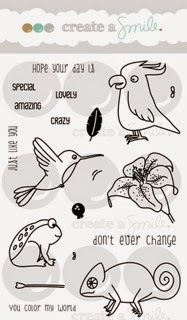 Maybe you use something different to create stencils - please let me know so I can try out. So far I am happy with both materials. Acetate is easy to cut in your Silhouette (I'll have a video about that in this series) and Mylar is easy to cut with dies (and probably by hand - I'll give that a try, too!). I hope this little comparison /tutorial was helpful. Let me know what you think about it. Hey there, this is a new Guest Designer Call for October! Woohoo! 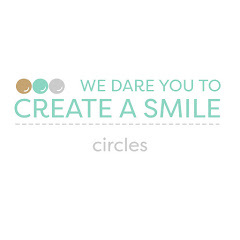 Add the "I love to play with Create A Smile" badge to your post, tell your readers about our Guest Design Team spot and link back to this post. Enter as many projects as you like. The linky tool closes on Saturday September 13th at 8am CET (2am EST). Our Guest Designer will be announced on Sunday September 14th. Impressive use of techniques. They can be simple but still have a great impact. 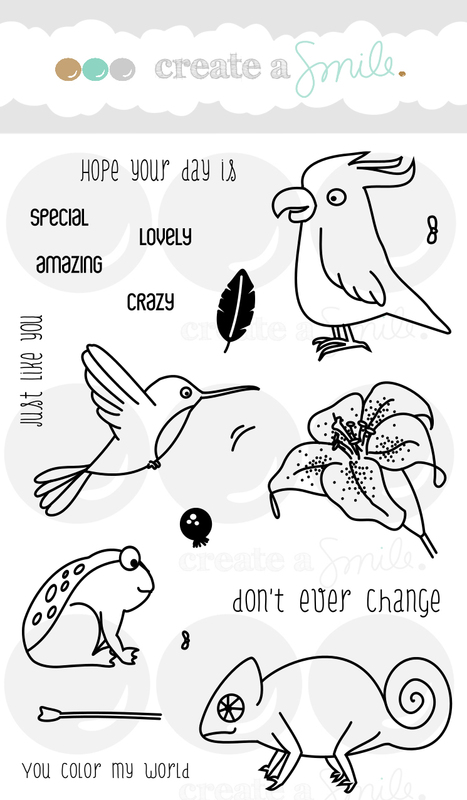 Get the best out of our stamps! Great Photography! I found out that cards that really catch my eye are usually the ones with the best photo. You want your projects to SHINE so take your time to take great photos! That makes a bigger difference than you might think. Fairplay. I was beyond impressed how many of you left supportive comments on each other's blog. 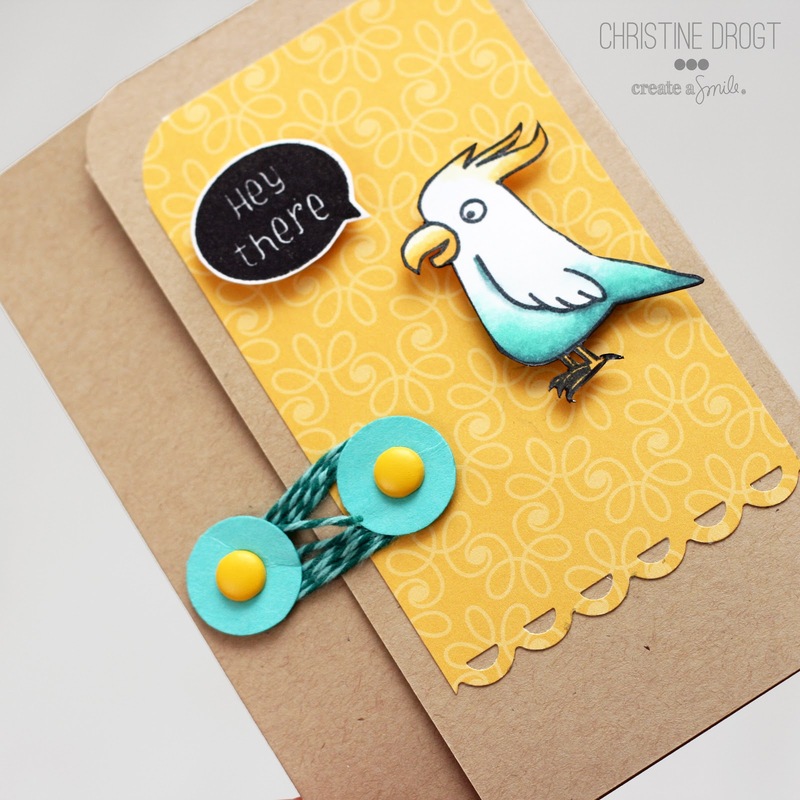 We just love the encouraging paper crafting community! Cleverness. A card that surprises us, makes us giggle or uses stamps in a way that we would never have expected are right up our alley! Today I want to talk to you about a serious problem! We all have these days when the creativity is lacking! I hate those days because I need crafting to relax after a busy day at work. In these moments I turn to some things I can always count on! I think everybody has a color combo that works for him. For me it is aqua - orange! Most of the time I like the projects that I create in these colors. The fox from the set Friends in the Woods is one of my favorite creatures ever! Things can't go wrong with this cute little guy! The internet is full of amazing sketches. USE them if you can't think of a good layout for your card! And this is how my "mojo-free" card turned out! What do you do when the mojo is on vacation? I love combining images from different stamp sets, and today's card could be my favorite reason why! Ha ha! I colored the images with copics and popped them up with some foam tape for dimension! The puppy is from Your View, and the bathtub and bubbles are from Comfy! Isn't that adorable!! I just love that the cute little puppy is having a spa day! I added lots of bubbles, and then added a little glossy accents to them, so they had some shine and dimension! The sentiment is from Jungle Fever, and I created my own banner and distressed inked the edges a little bit with vintage photo! The sentiment is heat embossed in white and popped up on some foam tape! 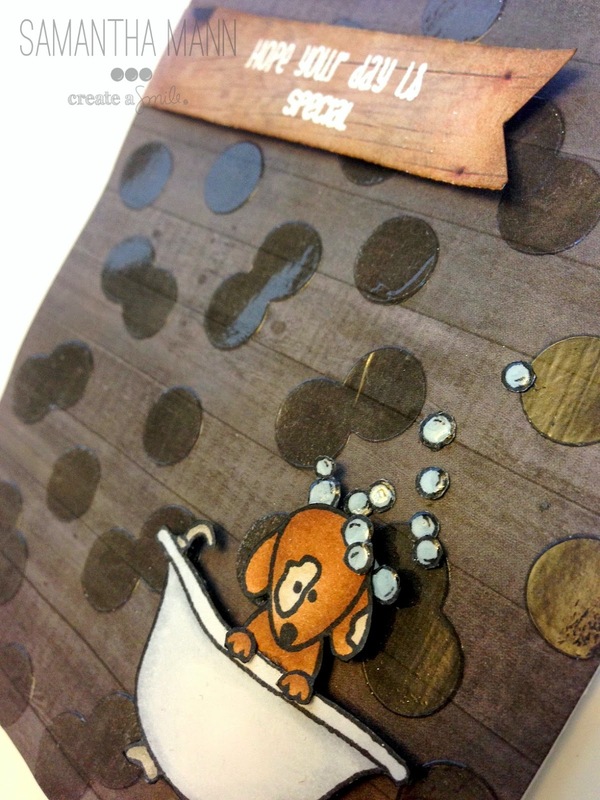 I just LOVE the different woodgrain papers too - it ALMOST has a masculine feel...almost! Lol! So that's my card! It could be a birthday card, or just a card for no reason to send to a friend! Double duty!! Ha! What are you doing this weekend? 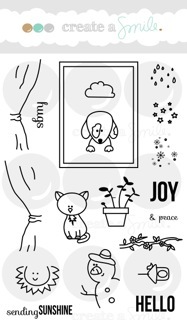 I hope it involves getting crafty - especially with Create a Smile Stamps! If you want to see TONS of inspiration, ALL IN ONE PLACE...check out the Create a Smile Stamps Pinterest board! You can't lose! Thanks for joining me this Friday! See you next week! I have a couple of fun cards to share with you today. I broke out my Jungle Fever stamp set, and set about copic colouring the frog and chameleon. I went for a blended ombre effect on the chameleon. 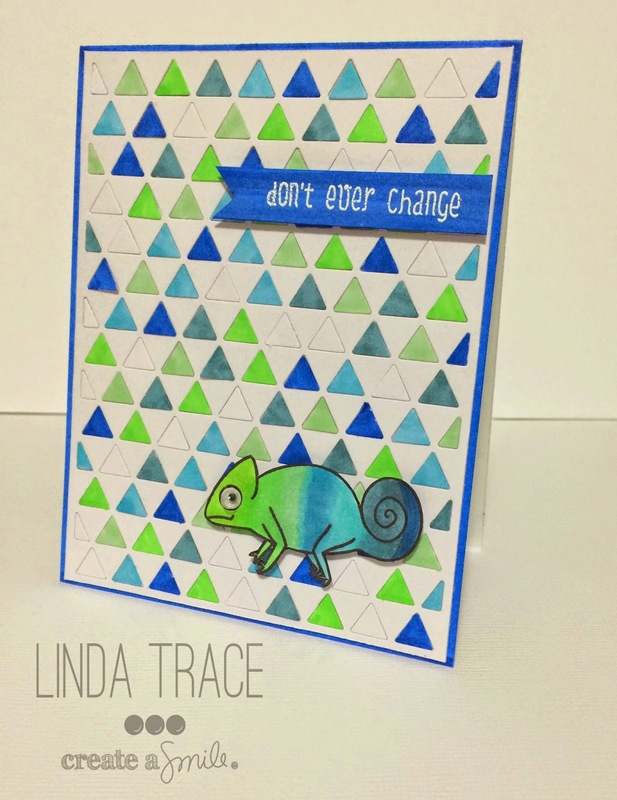 I diecut a piece of white cardstock out using the Hero Arts triangle background die, and then I filled the triangles back in, after I coloured them using the same colours as I used on the chameleon. I tried to be as random with placement as I could, to give an evenness to the card. I ended the card by mounting that panel on blue cardstock and heat-embossing a sentiment onto a strip of cardstock that I copic coloured in a matching blue. I added a googly eye to the chameleon too, coz, well, it's a googly eye and who doesn't love them?! I love how versatile these stamps are! You can do a heavily layered, mixed media type card, lots of colour and popping patterns on a card, OR a super simple clean white card. So great! Be sure to pop back again soon, for even more inspiration! 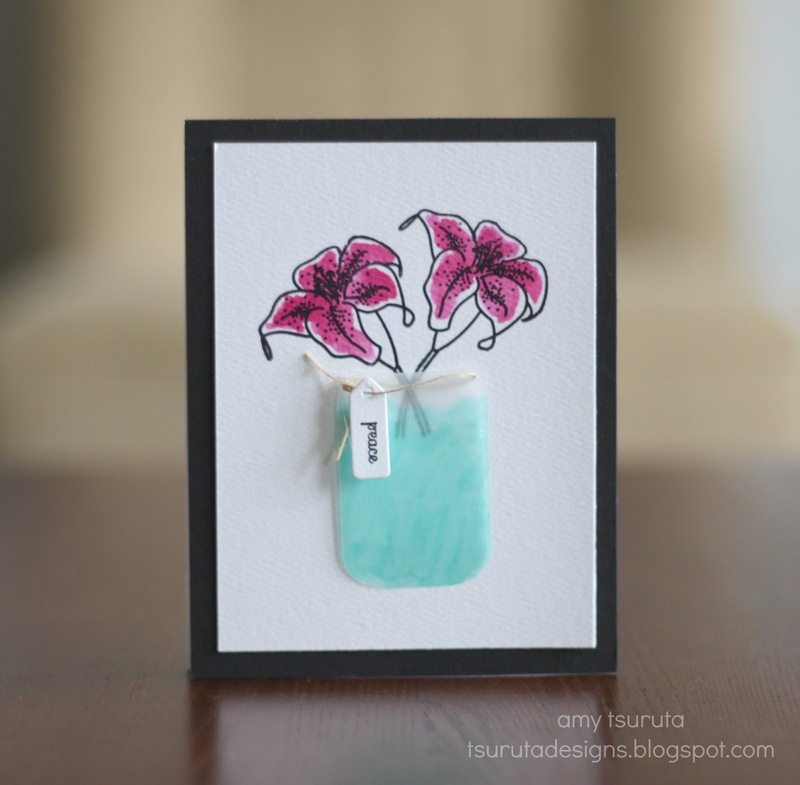 al you all know Amy Tsuruta joined us this month to bring some gorgeous projects and iinspiration to you. Check our her Intro and Part I and Part II if you haven't done so far. 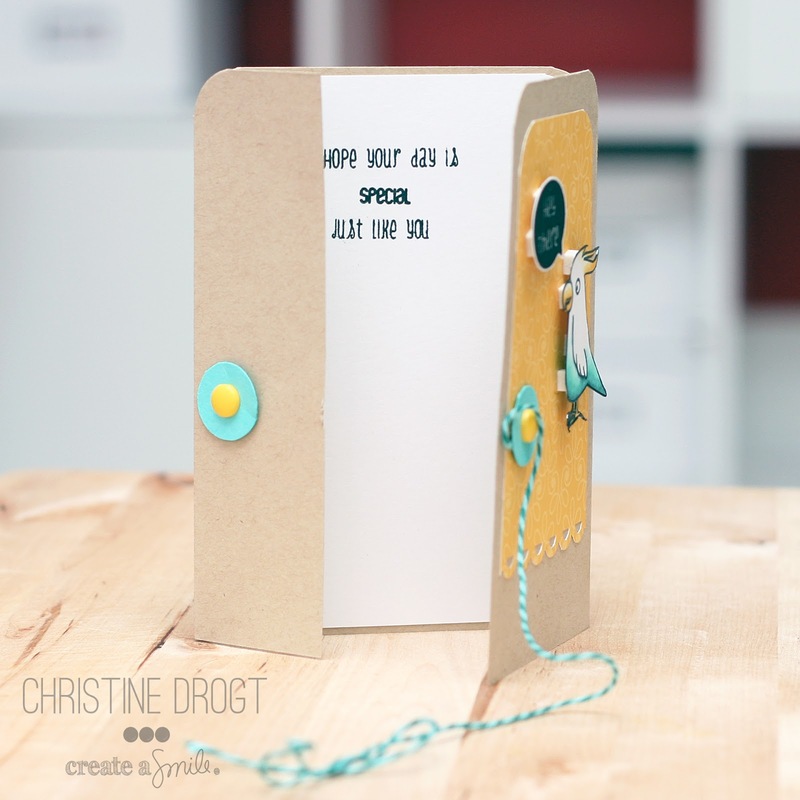 Like in part I she used a cardbase with distressed edges - so beautiful, don't you think? It's a quick card without fancy coloring or fuzzy cutting - it's the texture the rocks the card! Make sure to follow Amy's blog to find more inspiring work, great ideas and perfect execution! How are you doing today? Lovely I hope! Today's cards have been hanging out in the back of my mind for awhile. In fact as soon as I saw Your View for the first time I had plans for this one stamp. Oh yes, mhwahahaha, big plans. See that window there? That simple little rectangle. I love that rectangle. A little creepy? Meh, maybe. 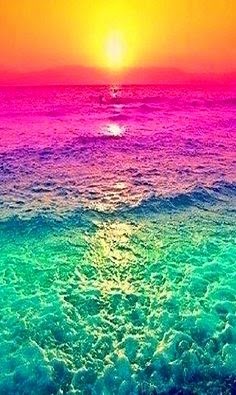 I knew what I wanted to do but I wasn't sure about my color combination so I consulted my "Fabulous Color Combos" board on Pinterest. This one really caught my eye! I stamped my windows directly onto my card base without masking. I stamped them again a TON more on scrap white and trimmed out just the middles. I colored with distress inks then added glitter. The sentiment was created with fabulous letter stickers that the most generous Christine sent me. Isn't she all kinds of awesome?! I've seen all these fun faux motion cards lately and I thought it would be cool to mimic them. More distress ink more glitter. Hi there, it's Anja here. But before we go over to the inspiration post of today I would first like to congratulate another teammember since it's her birthday today. Happy Birthday , Anika , hope you have splendid day!!!!!!! Now over to the card for today. It seems I use less designpapers nowadays, especially when I make CAS cards. How about you? I have lots and lots of very pretty designpapers but somehow they never seem to match my card. For this card I wanted to use designpaper and to give it some extra interest I made a panel. 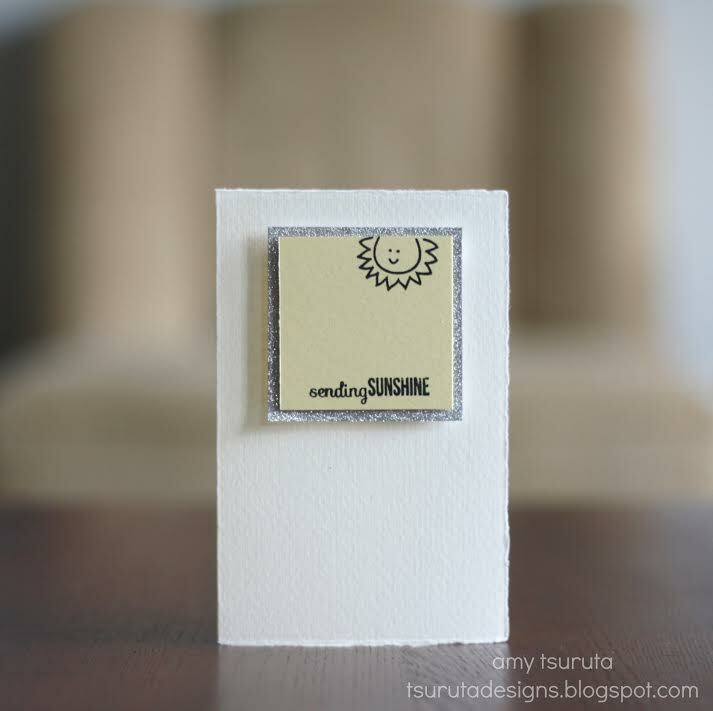 How do you use your designpapers on your cards? I stamped the hummingbird from jungle fever on watercolorpaper and colored it. I stamped the feathers very light a bit offline to give the bird some movement. Stamped the stripes from jungle fever to get more movement. I masked of the bird and did the sun with some distressinkt. Made a banner out of black cardstock and white heat embossed the sentiment from jungle fever. Did some drops with glossy accents to finish it off. Now for the fun part, I thought the bird could use something more so I gave it the glasses from the comfy set to protect it from the sun. Hope you like the card and wish you a very nice week. Today I have a video for you! I love to make videos, even if it takes some time. How many of you take videos? I am always on the lookout for great YouTube Channels and also for video-Guest Designers. If YOU have a Youtube channel and create card-tutorials, please leave a link in the comments - I know I'm missing a LOT of talent out there! Or if you have a favorite channel that you'd like to recommend - let me know as well! I got some new twine on friday. I ordered the most beautiful Trendy Twine from Annie's Paper Boutique because it comes in the most amazing color combos. I am addicted to baker's twine anyway (I collect it instead of using it, hehe!) but the multi-colored twine is my fav! I act the same whenever I get new supplies - I want to use them NOW! So I thought about ways to add twine to your card and realized I never added a lock to my card with twine, although I used this closure-technique for some card-boxes. A video-idea was born - and it's pretty simple! Hope the video inspires you to try it out! What's your favorite use of twine? I sometimes add it for a little detail on my card, but I KNOW there must be at least thousand ways to use it. Before you leave I'd like to let you know that I'll start a video-series on stencils from the basics to fancy techniques next sunday. I'll start a poll on our Facebook-Page to find out what your interested in. So if you have something you'd really love to learn - let us know! Enjoy the rest of your week-end and take time to relax! Give Mr. Squirrel a stage!! Today I want to talk about Mr. Squirrel! 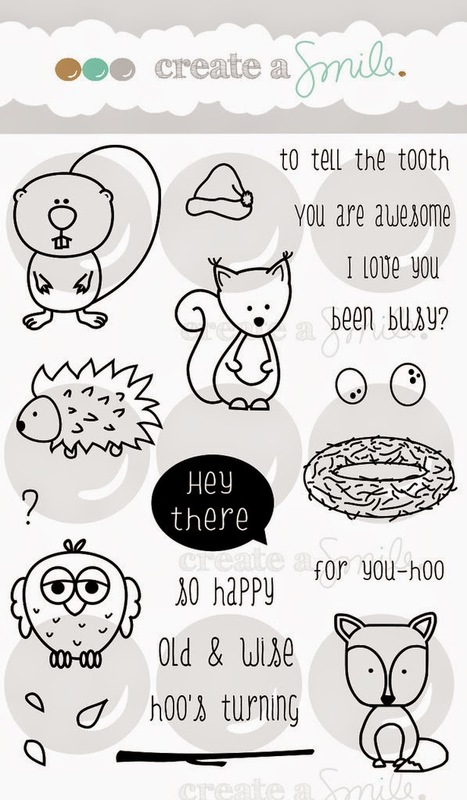 Mr. Squirrel is quite small, in fact a lot of the cute creature from Create a Smile are smallish. What I really love because I like CAS cards and small creature leave a lot of space for "white" space if you know what I mean! But what can we do to make them stand out? I have three tipps for you that work for me! Use a tag, banner, circle or something like that that works as a frame. This way he won't get lost on the card. As you can see on my card I colored Mr. Squirrel in a bright color. For the rest of the card I used muted colors or bright colors in a very small amount. Ok, that is easier for us in Europe because squirrels have a reddish brown overhere! The squirrels that I saw in New York were grey! So maybe you could make it the other way around: Color Mr. Squirrel in grey and keep the rest of the card in bright colors - that would make him stand out, too! Ok what a great advice for Clean and Simple designers ;) ! But with a small image you can't add too much embellishment or other details. Mr. Squirrel would get lost! We don't want that!!! Do you have other tipps to work with small images! Please tell us! I am eager to learn! Samantha here on this SUPER HOT Friday! Well...at least it's super hot by me (South Carolina). We have a Heat Advisory of 115 degrees today...not so lovely. How is the weather by you? I can only HOPE it's no where near as hot by you! Let's get to my card! See the sentiment? I used three different stamp sets to create it! "sending sunshine" is from Your View, of course. "to your" is from Friends in the Woods. 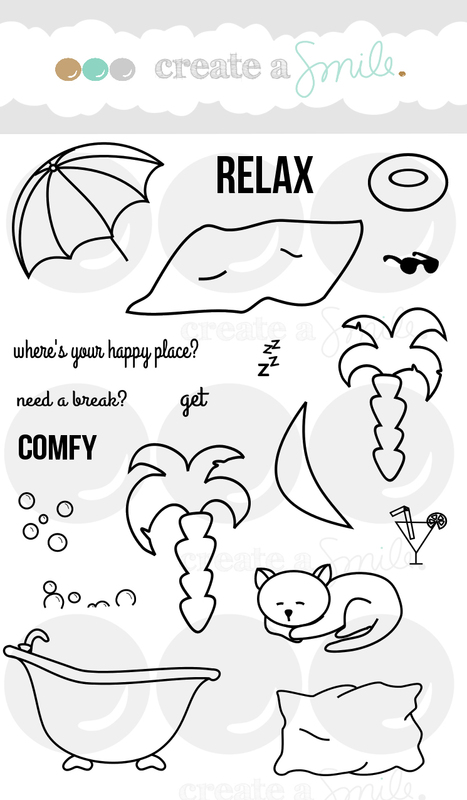 and "happy place" is from Comfy! I used lots of dimension on the little window scene! The kitty, sun, clouds and curtain were all colored with copics and the kitty and curtain were popped up! Oh, and the background has some AWESOME white embossing paste on it, with some white sequins! I really LOVE playing with white on white and adding dimension and texture and interest, without making the card busy! I LOVE the mix and match-ability of these sets! Thanks for stopping by! :) On your way out - check out the amazing, super cool and totally RAD Flickr group! 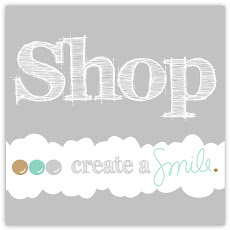 Share your Create a Smile Stamp creations with us!! Instead of using the beautiful flower image from Jungle Fever, in singular form, I thought it would be fun to see how it came together in a large bouquet type image. The banner is from Lawn Fawn, and the sentiment is Create A Smile :) I copic-coloured in the banner too. What images have you had fun using in multiples on a card? Let me know in the comments! I'd love to hear. Wednesdays are guest-days! I know you all love Amy Tsuruta's work and this one will be no exception. 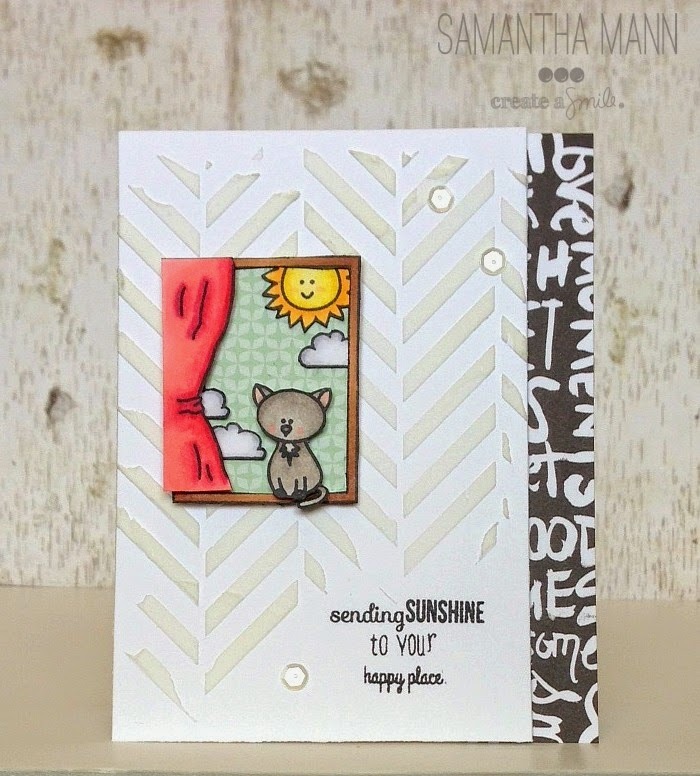 I have to say that this card was the first Create A Smile project with the new sets that Amy showed me - and I instantly fell in love with the softness, that she created. Amy stamped the lily from Jungle Fever twice. Her coloring, leaving a white outline on each flowers - looks amazing! Whenever I try to leave parts of an image white I end up filling it with a light color. Amy totally rocked this! The jar made of vellum (I guess so?) with that aqua color is adorable with the flowers. And that twine with a tiny tag and out tiny "peace" sentiment from Your view??? It makes it all perfect. Mounted on a black card gives a lot of contrast (another thing I find hard to do - black cards with white panels!). Wowzers! 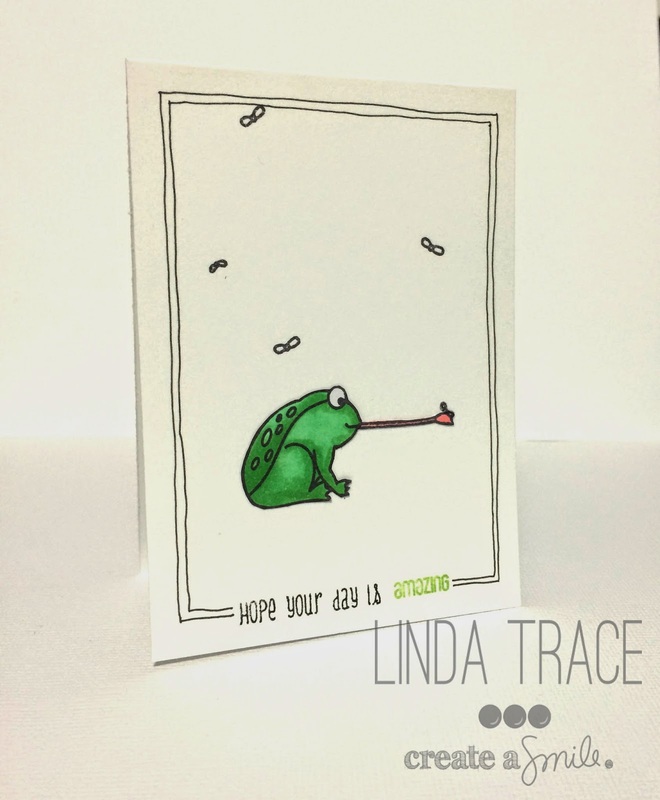 I would LOVE to get a card like this - what about you? You can see that it's made with love and creativity. I hope this sparked your creativity - it sure encouraged me to try that coloring technique again. 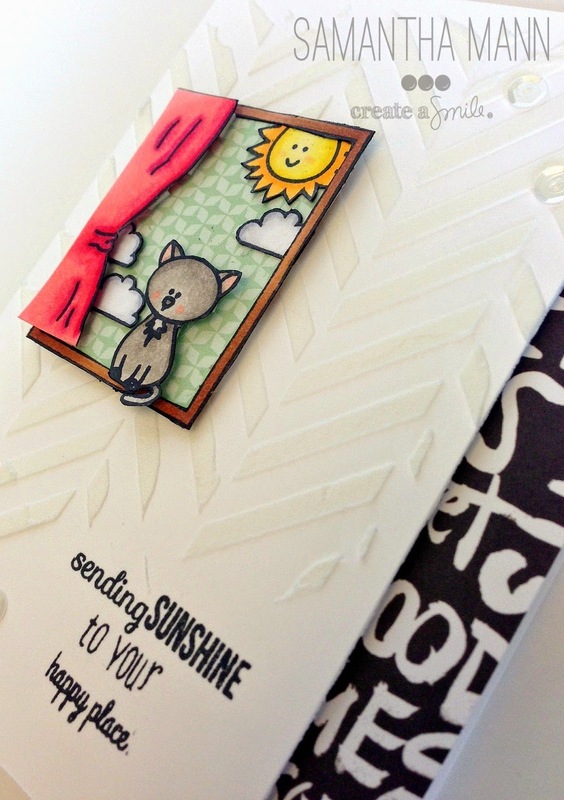 Hop over to Amy's blog to see more of her gorgeous creations and leave her some love! Loud Backgrounds: How Do You Use Them? a little layout with all four stamp sets! 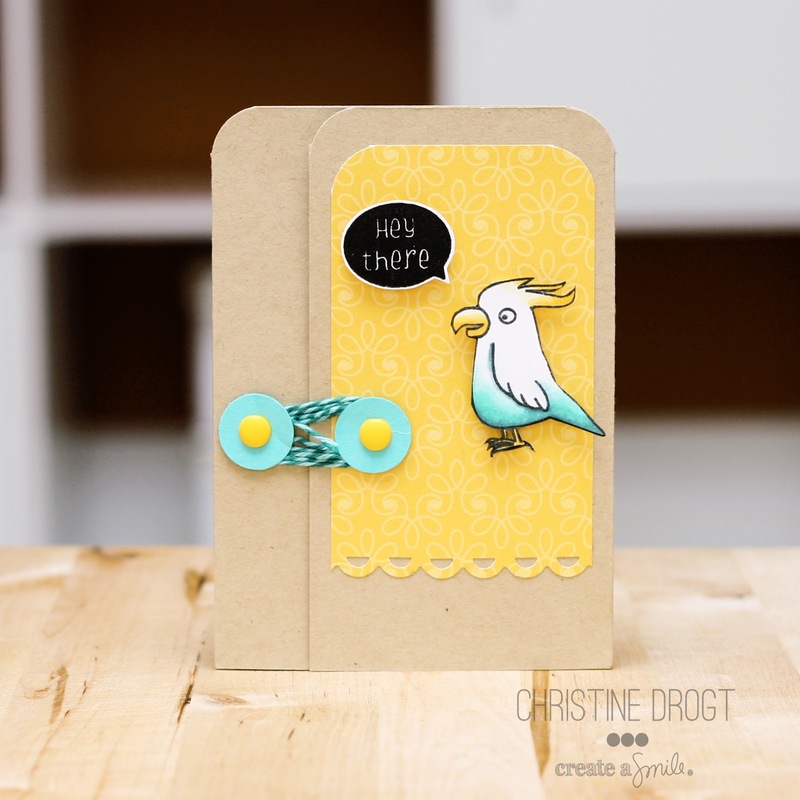 August Release Coundown "1" - Blog Hop!